-the infiltration bombing of Camp Chapman in Khost Province in December 2009, a FOB I knew well, to include several of the Americans and Afghans who were stationed there. -the awarding of the Medal of Honor to a US Army advisor I had some acquaintance with from our train-up at Fort Riley. -a long article in the New Yorker profiling the commander of the advisor unit two or three after I commanded it that name-checked many people and places I knew well. -a visit from Army Criminal Investigation Command (CID) telling me that they had detained a Russian-born jihadist who had attacked us in Khost in June 2009, killing one of the members of my team, who was the gunner in a truck in which I was a passenger. -a visit from another CID agent doing a background check on one of my linguists who is now translating for an American one-star general—this after emigrating to the United States, serving a tour in our Army, earning an Associates degree, and gaining his citizenship. -a visit from two lawyers on Bowe Bergdahl’s defense team, because my name figures somewhat prominently in the Army investigation report of the circumstances leading to the severe wounding of one of the soldiers involved in the search for Bergdhal. -the profile in a major media venue of an Afghan National Army officer whom I knew in Khost who has since emigrated to the United States. 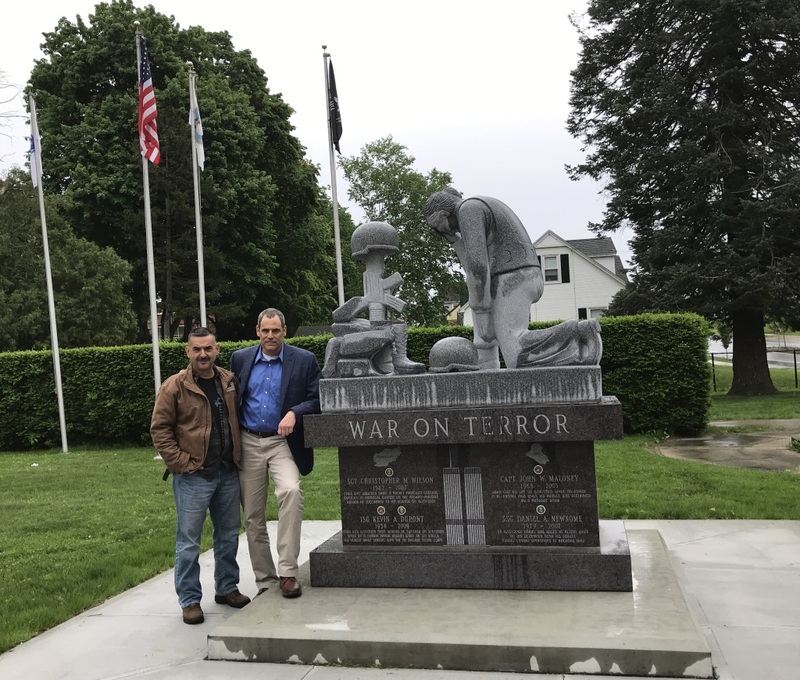 Last weekend, I was asked to offer comments at the dedication of the Chicopee, Massachusetts, War on Terror Monument. I received the invitation because one of the six men honored by name on the Monument had been a member of my advisor team. Then-Sergeant First Class Kevin Dupont died of wounds three months after being attacked by an IED in March 2009 while on patrol in the Khost-Gardez Pass. With Sergeant Dupont that day and joining us in Chicopee was then-Staff Sergeant Robert Perez, who subsequently spent eight months recovering and rehabilitating in San Antonio from wounds suffered in the same attack that killed Sergeant Dupont. It was an honor to help commemorate the Chicopee War on Terror Monument, catch up with now-First Sergeant Perez, and meet the family members of posthumously-promoted First Sergeant Kevin Dupont. In my remarks, I paid what tribute I could to the lives and deaths of Sergeant Dupont and Chicopee’s other fallen heroes: Sergeant Steven Larivierre (USMC), Gunnery Sergeant John Fredette (USMC), Captain John Maloney (USMC), Staff Sergeant Daniel Newsome (US Army), and Sergeant Christopher Wilson (US Army). My remarks in Chicopee are a little too long to publish here/now, but I’ll offer a repost from my old blog of the words I offered the Camp Clark family of soldiers, airmen, sailors, and Marines at the memorial service we held for Sergeant First Class Dupont in Afghanistan in June 2009. Read on if you please, and no problem if you’d rather not. I’ll be back soon with more book and movie reviews. “We are here today to honor the life of Sergeant First Class (SFC) Kevin Dupont, who has passed away of wounds suffered in an IED attack on 8 March of this year. With SFC Dupont, there is much to honor, for he lived a rich life and made a difference in many people’s lives. “Those of us in the room today knew SFC Dupont as a member of the Roughrider Embedded Transition [advisor] Team, and that is an important last chapter in his life. But there are other chapters, too, and I will touch on them first. He was the devoted husband of ___, with whom he shared the last years of his life. He is survived by his parents, ___ and ___, who knew him and loved him first. He was an ex-Marine, an experience that toughened him and filled him with pride. He was a long-time member of the Massachusetts National Guard, where he had many friends and many adventures. He was a member of an anti-drug task force in New England, where he battled a scourge that plagues the towns and cities of the region he loved so much. “For those of us who have read the testimonials posted on the website dedicated to SFC Dupont, it is clear that he had deeply touched those he met in each of these endeavors. For those of those who knew him here in Afghanistan, it is easy to see why. SFC Dupont was wise, he was competent, he was funny, and he was sociable. He made friends easily, and naturally sought to unite people into teams, families, and communities. He was always eager to help, to share any danger or hardship, to adapt to any new situation, and determined to have a good time while doing so. 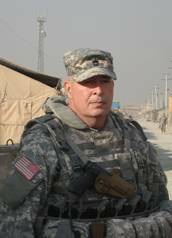 “These qualities made SFC Dupont a perfect Embedded Transition Team member. Being an ETT is a strange thing. We are plucked from more traditional units and places in the Army, organized into ad hoc units with no history or lineage, processed through two months of training at Fort Riley, deployed into theater, and then reorganized into new teams with the challenging assignment to improve the armies of our allies in the War on Terror. SFC Dupont exemplified the qualities it takes to succeed in such an assignment. First, he was brave and feared nothing. Though old—older than me—he was strong of body and young at heart. More importantly, he was mature, thoughtful, and open to new experiences. I first met SFC Dupont at Riley, when I gathered his team together because I knew that some of them would serve with me here in Afghanistan. The rest of the team was from Virginia, and I couldn’t figure out how this ancient, silver-haired New Englander had bonded so well with young men from the Blue Ridge Mountains. But it was clear that he had. “In Afghanistan, SFC Dupont was assigned to the 2/1 Kandak team, comprised mostly of California and Illinois men, and again he used his good cheer and positive outlook to make his presence felt strongly within their ranks. In particular, SFC Dupont proved his mettle on the night of 8 February 2009, when he stood side-by-side with his ETT and ANA brethren in gun-battle with anti-Afghanistan insurgents in the town of Shimbowat. SFC Dupont never flinched or wavered, and his courage spread through the ranks of both Americans and Afghans. “Next, SFC Dupont was assigned to FOB Wilderness, where Coalition Forces and the Afghan National Security Forces battle insurgents trying to block construction of the Khowst-Gardez highway. At FOB Wilderness, a conglomeration of Hescos and Bhuts as desolate as its name suggests, SFC Dupont found his final community, his final home, his final family. The crown prince of Wilderness, SFC Dupont was known and respected by all the disparate residents of that lonely but strategically important outpost. Two Coalition task forces, a PRT team, and a PMT team learned what the Roughrider ETTs already knew: if something needed to be done, if a problem needed to be fixed, if a helping hand was required, SFC Dupont was always ready and willing to assist. “SFC Dupont’s team chief, MAJ ___, and I assigned SFC Dupont to FOB Wilderness because we knew it was a tough mission. Remote and austere as Wilderness is, duty there would challenge even the best of the units. 2/1 Kandak is a new unit, and it’s no secret that they were struggling to accomplish even the most basic tasks and missions. Even worse, the morale of 2/1 soldiers was at rock-bottom, in particular because of a devastating friendly fire incident that occurred weeks before our arrival that resulted in the death of eight of its members. It was these challenges MAJ ___ and I hoped to reverse by sending SFC Dupont to reside and work at FOB Wilderness. I am glad to report that we succeeded—that SFC Dupont succeeded–beyond expectations. “It was clear from my visits to Wilderness that the ANA soldiers with whom SFC Dupont served adored him. They would do anything he asked them, and they dreaded letting him down. They called him “Baba”—or beloved old man—in view of his age, but they did so with respect and because they enjoyed his company to no end. SFC Dupont, in his short time here, learned more Dari and Pashtun than any ETT on our team. He used this skill to great effect, continually laughing and joshing—often extremely profanely—with his ANA partners. All this came naturally to SFC Dupont, for he loved people in all their varieties, but it also enabled him to be enormously effective. From friendship and camaraderie came trust and respect, which enabled SFC Dupont to chide, coach, correct, and encourage 2/1’s Wilderness soldiers to re-commit themselves to the mission, to keep their standards high, and to learn once again to depend on their United States Army partners. “So here’s to you, SFC Dupont. You may well have been the best ETT of us all, and when this War on Terror is finally won, it will be because of the contributions of great men and women like you. I only wish you had been able to complete your tour with us, and then return to your friends and family in New England. You gave every bit of yourself to the mission, and set an example for us all to aspire to. You were a great American, which means you were a great man period, and the good Afghans for whom you sacrificed your life recognize that fact as clearly as we do. Rest in peace now my brother, and we’ll see you on the other side. This entry was posted on May 22, 2018 at 9:49 pm and is filed under General. You can subscribe via RSS 2.0 feed to this post's comments. You can skip to the end and leave a response. Pinging is currently not allowed. Beautiful tribute, Peter. You have experienced so much and contributed so much in service of your country. Sad as the death of SFC Dupont is, thank you for sharing this story of another brave American. Love, B. Thank you, B! It was an unforgettable weekend in Chicopee, full of both very gratifying conversations and also some very difficult ones.